A cataract is a collection of proteins that builds on the lens of the eye and causes a cloudy formation. The clouding interferes with a patients’ vision and leaves them reliant on prescription lenses. Unfortunately, as a cataract grows, even the strongest vision prescription will be ineffective in providing clear eyesight. 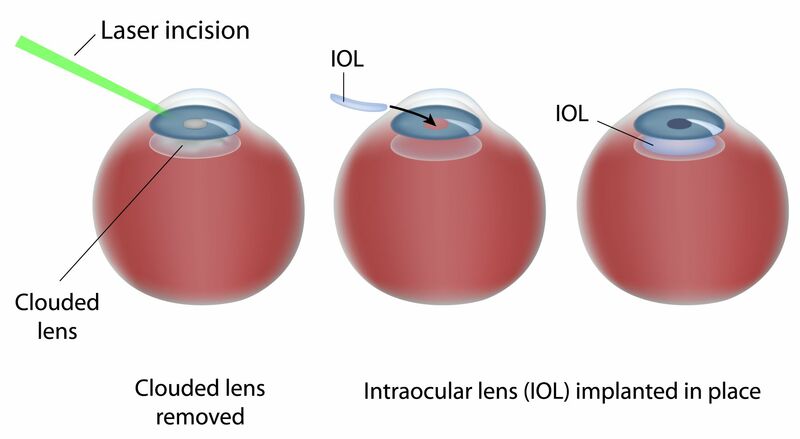 Laser cataract surgery removes a lens that has been compromised by a cataract and replaces it with an IOL, or intraocular lens. Cataract surgery is the only effective, long-term treatment for advanced cataracts. Dr. Thomas J. Byrd prefers to perform laser cataract surgery, rather than traditional cataract surgery, at his eye care practice. Laser cataract surgery benefits our Detroit, MI patients by providing superior precision, accuracy, and safety. Cataract surgery treats cataracts by completely removing the clouded over lens and replacing it with an artificial lens that allows patients to see a clearer, sharper image. To remove the lens, a small incision must be made in the eye. During traditional cataract surgery, this incision is made with a handheld blade. However, during laser cataract surgery, Dr. Byrd uses the Alcon LenSx® femtosecond laser to create a precise and perfectly round incision around the capsule of the lens. After breaking up and removing the lens, the laser is used to treat any astigmatism the patient may have. Finally, Dr. Byrd will place an artificial lens, or IOL. If a patient is suffering from cataracts, he or she will benefit from cataract surgery. Any form of cataract surgery results in crisper, clearer vision for the patient, along with a reduction in the need for prescription lenses. The Alcon LenSx® femtosecond laser creates a perfectly sized, round hole that is ideally centered around the capsule of the lens. This precision is nearly impossible to duplicate with a traditional keratome blade. Using the Alcon LenSx® femtosecond laser, Dr. Byrd is able to soften the cataract before removing the damaged lens. This technique minimizes the damage to surrounding tissues. Laser cataract surgery is more accurate and provides superior results. Over 90 percent of our patients who undergo laser cataract surgery are able to see at a distance without the use of prescription lenses. Laser cataract surgery offers improvement of astigmatism. Dr. Byrd is able to use the laser to round out the shape of the cornea before placing the IOL. The precision and safety of laser cataract surgery greatly minimizes the risk of surgical complications. Overall, laser cataract surgery is a safe, precise, and effective procedure that allows patients to go about their day-to-day tasks without relying on prescription lenses for clear eyesight. Laser cataract surgery is a highly successful treatment that can enhance the vision of individuals suffering from cataracts. If you have questions about the laser cataract surgery procedure, or would like to know if you are an ideal candidate for treatment, contact us at your earliest convenience.